If the stories we tell about our lives help to shape our identities, we need to consider the stories that our students are sharing about themselves with regards to their experiences in our classrooms. Chris will reflect upon the current status of education and challenge us to work to create the conditions for students’ stories from school to become a more positive narrative - one in which they are aware of their strengths, challenges, passions and identity. He will share Canadian and US examples to highlight the power of a learning environment and community in which we key in on the strengths and interest of students. These stories from K-12 show how connecting students to authentic audiences and practicing inquiry helps students become more confident and engaged. Chris will challenge teachers to think about how their assessment and recognition of students makes their time in our schools more meaningful and allows all of us to build positive stories and identity around ourselves as learners and the work we do. Chris is a father of 3 year old twin girls and a former high school PE/Science/Math teacher and volleyball coach. 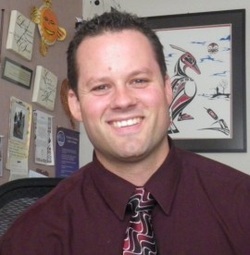 He currently works as a teacher/principal of James Hill Elementary in Langley, British Columbia. Previous to this, he worked as a teacher/principal in the community of Agassiz, British Columbia in which he worked with the staff to create positive changes in school culture, student motivation, assessment, technology, passion-based learning, and parent engagement. He also advises and works on committees with the British Columbia Ministry of Education and other agencies to create educational change in areas such as curriculum, assessment, and technology. As a leader in education and professional learning, Chris learns and shares with others in his network on Twitter at @chriswejr as well as on his blog at chriswejr.com. Chris is a strong believer in the power of social media to share stories that drive educational change and has presented online as well as in Western Canada and the United States. In addition to his keynote address, Chris will facilitate breakout sessions in the morning and afternoon (A02 Keynote Follow-up) and afternoon (P01 Social Media in Education).